Powers/Abilities: The Spider-Man imposter possessed no superhuman powers but was a skilled con-artist, managing to convince nearly an entire town that Spider-Man was a criminal just by posing as him and committing crimes. (The Amazing Spider-Man in Seeing Double) - Planning to rob a local museum, a group of criminals realized that they would need to take Spider-Man out of the picture. When one thug suggested they let the police handle Spider-Man, another thug asked what the plan was. The second thug soon learned the plan first-hand when he was tasked with disguising himself as Spider-Man and setting a fire on Main Street. Sent to get photos of the fire for the Daily Bugle, Peter Parker was shocked to see Spider-Man escaping the scene as a third thug reported to the fire chief that he saw Spider-Man start the fire. Not missing a chance to discredit Spider-Man, J. Jonah Jameson quickly had the Daily Bugle print up a front page headline blaming Spider-Man for the fire. Shortly thereafter, when Peter Parker visited the museum during an exhibit, his spider-sense warned him of the same thug he had seen earlier at the scene of the fire. Changing into his Spider-Man costume and hiding in the air ducts in hopes of catching the thug committing a crime, Peter watched as the thug, together with the imposter Spider-Man and another crook, waited until everyone had left the museum. The Spider-Man imposter then surprised the security guard while the other thugs began pilfering the artifacts from the museum. 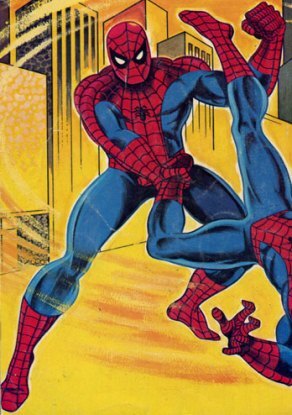 Spider-Man soon surprised the criminals, facing his double in hand-to-hand combat and easily defeating the crook. Thinking he had knocked out all of the criminals, Spider-Man prepared to call the police, unaware that a fourth thug was sneaking up behind him. After using a gas gun to knock out the real Spider-Man, the criminals escaped with many of the artifacts, leaving the real Spider-Man to get arrested by the museum’s security guard for the crimes committed by the imposter. Waking up in jail, Spider-Man escaped and began a search for the criminals in order to clear his name. When the police discovered Spider-Man’s escape, they alerted all cars to be on the lookout for the wall-crawler. Upon eluding the police, Spider-Man found the crooks loading more museum artifacts into their truck. Waiting until the Spider-Man imposter had his mask off, Spider-Man confronted the crooks, webbing them up just as police officer Harry and his partner arrived on the scene. Spider-Man then pointed out the maskless imposter and revealed to the police the crooks’ loot from the museum. He also explained to the police that the crooks had started the Main St. fire as well by pointing out their gas can. Convinced that the true Spider-Man was innocent, Harry and his partner commended Spider-Man on a job well done just as J. Jonah Jameson and a Daily Bugle note-taker arrived on the scene wondering what had happened. Comments: Created by uncredited writer & artist. 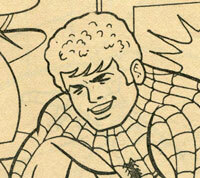 The Spider-Man imposter and his gang were never given actual names in the story. The coloring book, while being published by Whitman, carried a copyright 1976 Marvel Comics Group, indicating that all characters contained therein were the property of Marvel and not Whitman. Harry was a police officer who, along with his partner, was informed of the true Spider-Man's escape from jail, unaware that the true Spider-Man was not guilty of the crimes committed by the imposter Spider-Man. When they found the real Spider-Man web-swinging through town, Harry and his partner followed the wall-crawler in their squad car until Spider-Man eluded them by ducking into an alley. Eventually tracking Spider-Man down, Harry and his partner arrived just as the real Spider-Man had caught the criminals. Spider-Man then revealed to Harry and his partner the imposter Spider-Man and explained that they had committed the crimes attributed to Spider-Man. Convinced, Harry and his partner commended Spider-Man on a job well done and arrested the crooks. 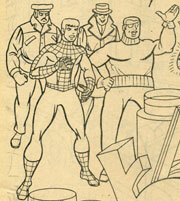 The Spider-Man imposter's gang was a group of criminals who enjoyed robbing museums of their artifacts. After plotting to get rid of Spider-Man, they decided to have one of their own dress up as Spider-Man when they committed the crimes, thereby incriminating the wall-crawler. They first started a fire on Main Street, blaming Spider-Man for it, and later began robbing museums to further incriminate the wall-crawler. When Spider-Man confronted them at the museum, one of the thugs used a gas gun to knock out the hero, who was then arrested by museum security. The thugs continued robbing museums until Spider-Man escaped jail and confronted them once more. Defeating them just as the police arrived, Spider-Man explained the criminals' deception and the crooks were quickly arrested.